Lakshmi, her imagery and the way we tell stories about her are India’s way of communicating ideas about wealth, good fortune and prosperity. A Kolam is a folk art using dry rice powder traditionally and chalk powder or white rock powder nowadays.For longevity, dilute rice paste or wet chalk are used. Since kolams are thought to bestow prosperity to homes,even today,every morning millions of women draw kolams on the ground ,while praying silently. It is a form of meditation.Through the day, the drawings get walked on, rained out, or blown around in the wind; new ones are made the next day. Kolams should preferably be drawn in coarse rice flour or atleast with rice flour mixed with chalk or rock dust.Rice flour is seen as an offering to Lakshmi, the goddess of rice. In South India, where wealth is measured in terms of rice fields, Lakshmi plays an essential caretaker role to assure the family’s continued existence and survival. The goddess has the power to attract wealth and prosperity and to prevent poverty from entering the home. The festival of Diwali is associated with Laxmi, the goddess of wealth; it is considered an auspicious time for spending and earning money. The customary trading tradition on the day of Diwali is unique to India where markets open for a short duration in the evening to pay obeisance to Lakshmi, the Hindu goddess of wealth and prosperity. This Muhurat Trading is a centuries old tradition. The day holds significance as it marks the beginning of the New Year, as per the Marwari tradition.Also the Gujarati new year begins a day after Diwali. More often than not, the benchmark indices have ended higher, albeit by a small margin. The time for trading is specified by the exchanges and usually takes place for about an hour.This year,the Muhurat trading happened on 13 November between 3:30pm and 5:15pm. The world’s first coins were Greek, made in Lydia about 640 BC. 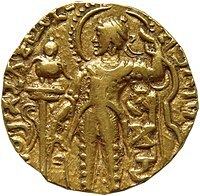 The earliest Indian coins were silver, and it was not until about 100 AD that the Kushan emperor Vima Kadaphises introduced the first Indian gold coin, which was a gold dinar bearing the image of Shiva. So India’s history of issuing gold coins dates back almost 2,000 years.Over this length of time India has produced many different denominations of gold coins, which include Dinars, Staters, Kahavanus, Pagodas, Tankas, Ashrafis, Mohurs, Gadyanas, Bhairava Gadyanas, Varahas, Fanams, Koris, Xerafims, and Tolas. Shri means wealth.It is also a word used to show respect.Yantra means instrument. 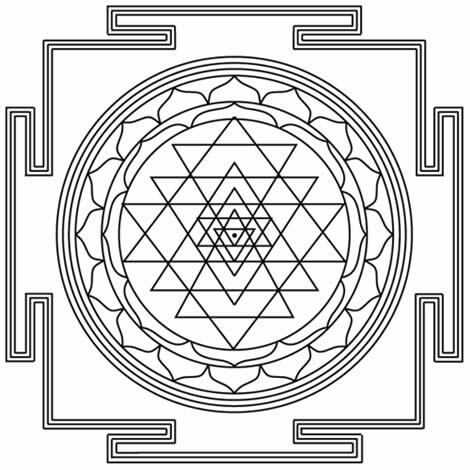 The Shri Yantra is formed by nine interlocking triangles that surround and radiate out from a central point. Together the nine triangles are interlaced in such a way as to form 43 smaller triangles. The Shri Yantra is considered to be very powerful and is believed to be the yantra of Goddess Mahalakshmi.Mahalakshmi is the Indian Goddess of wealth,prosperity and good fortune.She is believed to manifest herself in the place where this yantra is kept and worshipped.As a result all wishes come true and one’s life is changed for the better.This Yantra is believed to be helpful in getting rid of debt. Many temples in India, including the Tirupati Temple,the richest one in India, are constructed on the basis of this sacred geometry.